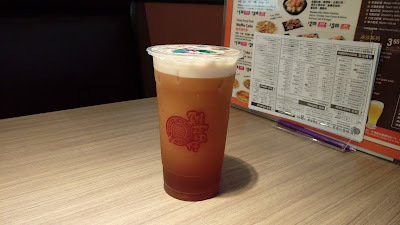 First to arrive was my half-sweetened Black Tea 泡沫紅茶. Unlike out previous visits where our drinks were solid, this time, the tea was quite diluted. The Noodle Combo At Your Choice 百搭自選湯麵套餐 was $8.95CAD per bundle, with various extra charges for miscellaneous add-ons and sides. 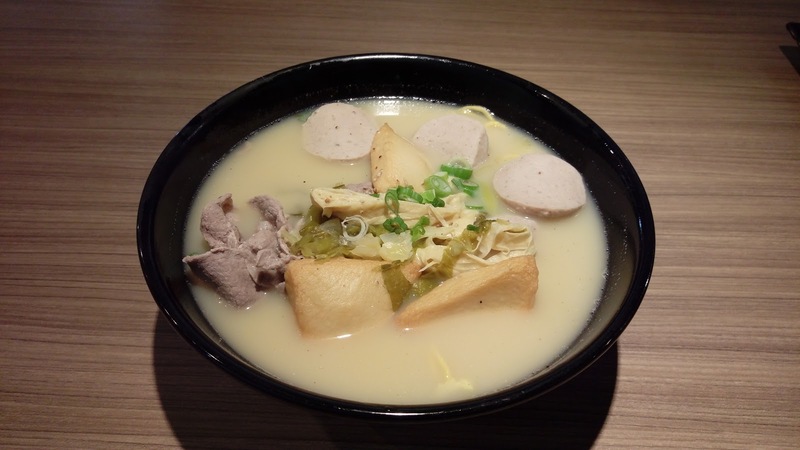 I chose a soup base of Pepper & Pickled Fish Soup 胡椒酸菜魚湯 with Sliced Kurobuta Pork 黑豚肉, Chicken Balls 雞丸, Fried Fish Cake Edge 炸魚片頭 and Egg Noodles 油麵. I also requested my bowl with no napa cabbage 紹菜 (大白菜). The soup had fish essence, but the chicken broth was significantly more palpable. Using mostly peppercorn, the soup was quite peppery. With very small amount of sauerkraut in the bowl, the pickled vegetable fragrance was minimal. The noodle section of the menu was a bit misleading. The menu states "Egg Noodle" (蛋麵) in English but the Chinese translation was listed as "油麵" (Oil Noodle). 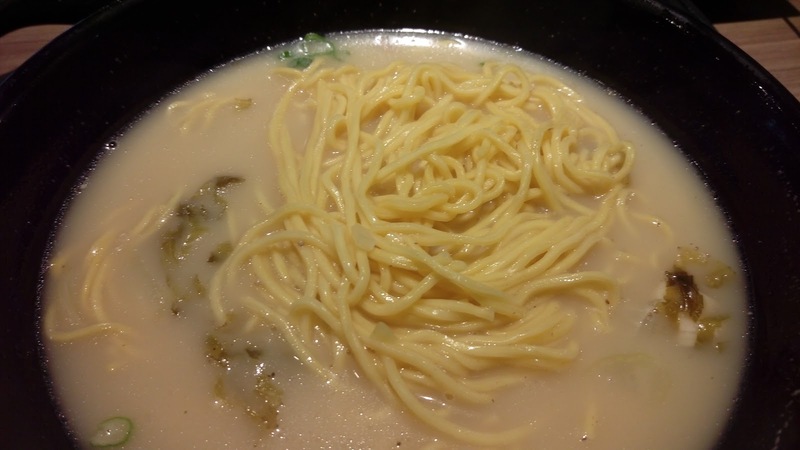 These two types of noodles are different in terms of production and texture. Which was served? Overcooked oil noodles. 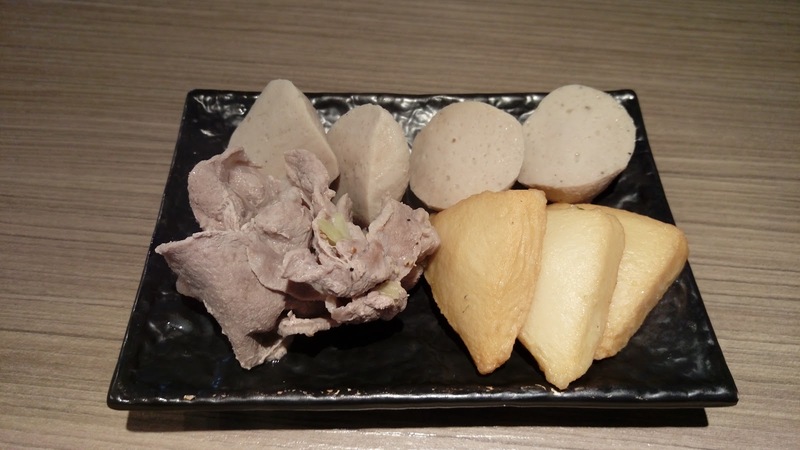 All the ingredients were commercially-made so nothing much to comment about with the exception of the pork slices, which were thick, tough and resembled nothing like what Kurobata pork slices I have tried in the past. Portions of the ingredients were lean. With my soup noodle combo, I was eligible to order two sides at discounted prices. 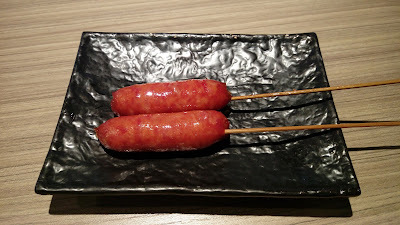 The first was Taiwanese Sausage 台灣香腸. 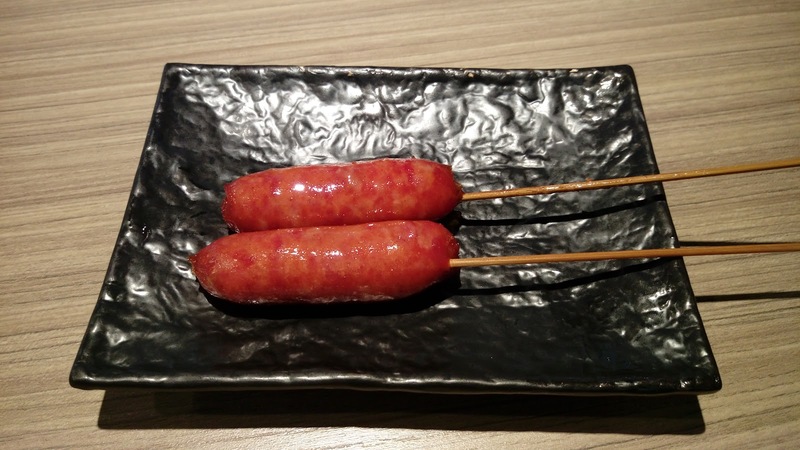 While these small links were retail quality, these were succulent, savory and not overly sweet. The second side was the Fish Cake with Minced Cuttlefish 香脆甜不辣. 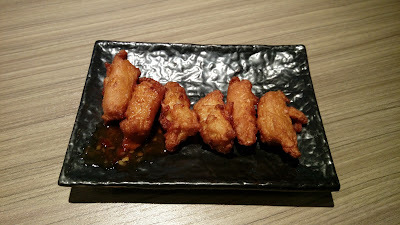 From the Chinese menu name, I was expecting the crispy Taiwanese-style deep-fried fish cake which is usually sliced thin These pudgy fish chunks had crispy outer coats, but the inner fish paste did not have much noticeable cuttlefish. The accompanied dip used was the common Thai sweet chili sauce. My soup noodle combo also entitled me to a discounted order of Original Bubble Waffle 原味雞蛋仔. Because the waffle was put in the bag earlier than it should be, the bubbles sitting at the bottom of the sack were soft and soggy. 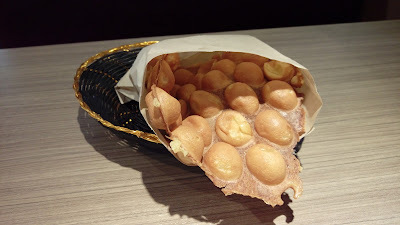 Other than the mix & match Noodle Combo at Your Choice 百搭自選湯麵套餐, this Bubble Waffle Cafe in Killarney Centre also offers mix & match Teppanyaki Rice Combo 鐵板飯套餐. Noodles or rice, your choice. Yes, I ordered a lot for one person. After all said and done, my bill was $19.29CAD, before tax. Was it worth the money? No. Especially when we visited only six month ago and there's already an increase in prices with a decrease in quantity/quality.